One of the best desserts ever! 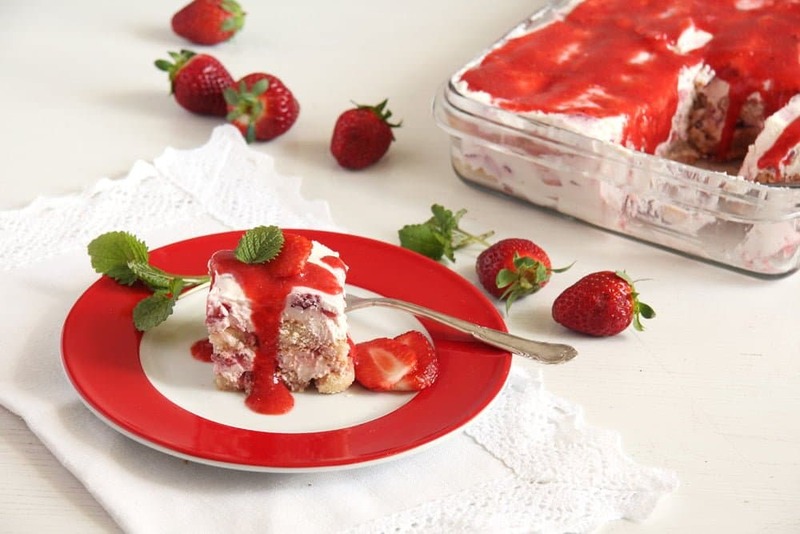 Sweet lady fingers layered with strawberries and a velvety mascarpone-quark mixture – so goooood! Strawberries! Strawberries! 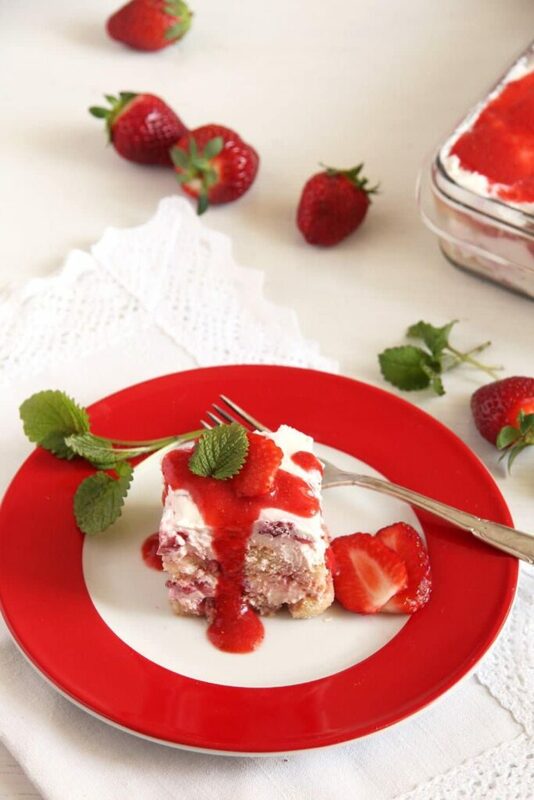 We have two weeks ahead of us filled with strawberries (mostly dessert recipes) sugar and red colors… Who doesn’t like strawberries, the symbol fruit of late spring and early summer, red, little, aromatic jewels. For some reason, I have always associated strawberries with youth, with perfection. The perfect shape of a strawberry, that deep red color, those tiny seeds that give them that look of somebody taking particular care in adorning them and making them beautiful… strawberries are just irresistible, I really don’t know anybody who can honestly say, they can resist a nice, ripe, juicy strawberry (well, probably only people with a strawberry allergy). I do love strawberries! I am anticipating their coming early in the spring, thinking about new ways of using them while they are there, resisting the urge of buying those early, unripe strawberries coming from God knows where and patiently waiting for the sweet and aromatic German strawberries, which you can buy in those special asparagus/strawberry boots around the town or even better, waiting for the maybe not quite so perfect looking strawberries growing in the garden, not quite so perfect looking but definitely better tasting than any other strawberries you could possible buy. During this time of the year, we have strawberries in the fridge almost all of the time, my children would even choose plain strawberries for dessert instead of chocolate or gummy bears (imagine that!!!! ), they love picking them up themselves in grandma’s garden or in the strawberry field (we have to do that again this year, they love it…). And they want strawberries in any kind of dessert or cake I make during this time of the year. And then there is the strawberry jam, which is the most beloved jam in our house. 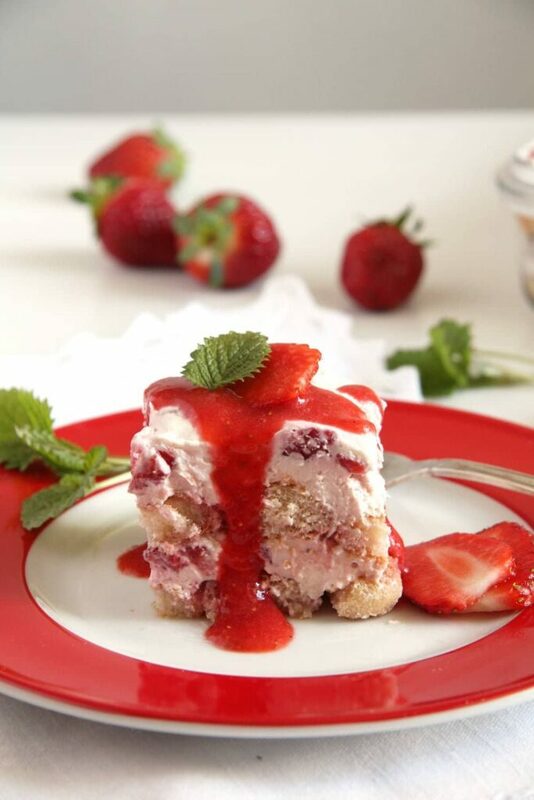 But coming back to this strawberry tiramisu. 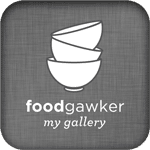 If you have been following this blog for a while, you might have noticed that I am really into tiramisu. I like the luscious and heavy original, but I love its fruity variations even more. Over the years I have been making it with different kinds of fruit or berries, for example Apple Tiramisu or Orange Tiramisu. Now was the time to try it with strawberries and I am so glad I did, it is a dream! 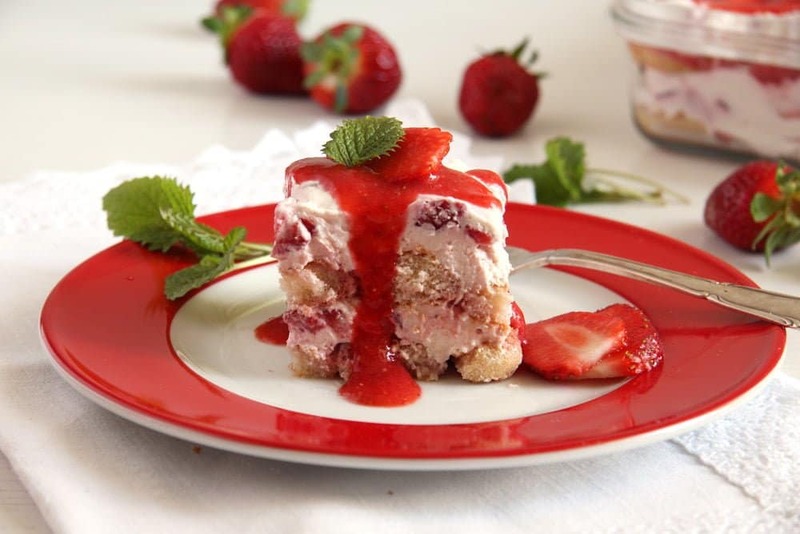 I made this huge dish of strawberry tiramisu for a very big birthday party not long ago and I have to say, that although there were several other dessert options on the table, my dessert was the first to go. And I cannot even remember how many times I had to scribble down the recipe that evening and during the following days. Clean the strawberries. Puree 200 g/ 7 oz of them with 1 tablespoon sugar. Place in the fridge. Chop the rest of the strawberries into small cubes and set aside. Mix together the mascarpone, quark and sugar. Beat the heavy cream until stiff and fold in the mascarpone mixture. Add the vanilla extract and lemon juice to taste. Fold in the cubed strawberries as well. In case you want this sweeter, you could add some more sugar, it also depends on how ripe and sweet the strawberries are. Start layering half of the lady fingers in a rectangular casserole dish. Sprinkle the biscuits with some of the juice. Spread ¼ of the pureed strawberries on them and then half of the mascarpone mixture. Repeat one more time with the rest of the lady fingers, another ¼ of the strawberry puree and the remaining mascarpone mixture. Save the rest of the strawberry puree in the fridge, covered, until ready to serve. Cover the tiramisu with plastic foil and place in the fridge for several hours or overnight. Spread the remaining strawberry puree on top just before serving. Or you could make only half of the puree needed and top the tiramisu with freshly sliced strawberries instead. Decorate with a few mint or balm leaves. 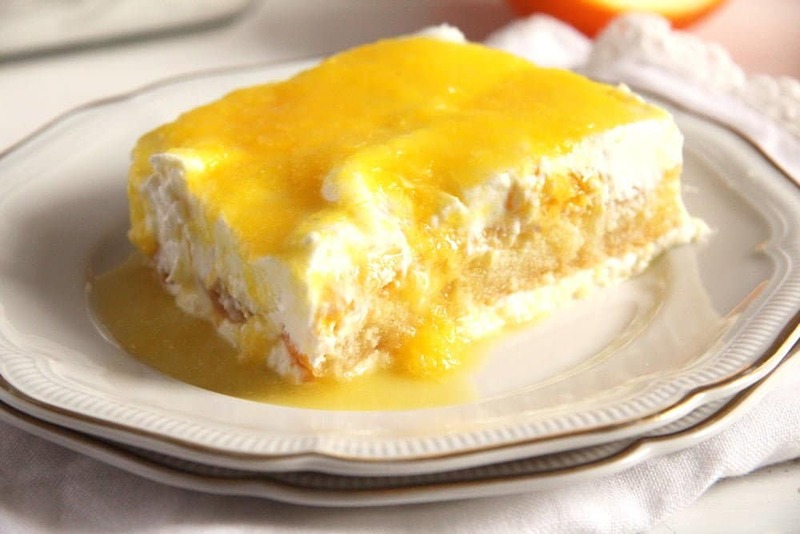 I love to add seasonal fruits in this classic Italian dessert too. Yours look heavenly. Fruits make it fresher and more suitable for summer, I think. It looks wonderful and so pretty! I can see why it disappeared! It looks delicious. I’ve made a similar dessert with strawberries, it’s just stunning. Thank you, Anca. Strawberries make anything great, isn’t it? you’re definitely doing justice to strawberries with all of your creations! this one may be my favorite–it’s beautiful and full of delicious ingredients!